SEO is a broad field and applies to three distinct areas of optimization for your site to do well in search engines. You can and should do two of those phases yourself. Discover what they are, what you must know about them, plus the difference in white and black hat SEO. First, let’s get familiar with the parts of SEO in a way that’s easy to understand. This is all about whether Google and other bots can crawl your site, and what type of info they can collect. For example, there may be issues with your site that result in lots of 404 (page not found) or other crawl errors. You can see those in your Google Search Console account. Or, you may be blocking crawl bots, called spiders, from indexing certain areas of your site that they would prefer to have access to. That’s done via your robots.txt file. You can see those issues when running site tests in Google PageSpeed Insights and Google Mobile Friendly. And, this phase includes setting up your SEO plugin correctly too. A full 90% of my site audit clients have the Yoast SEO plugin installed but not properly configured. And that is doing more SEO harm than good. 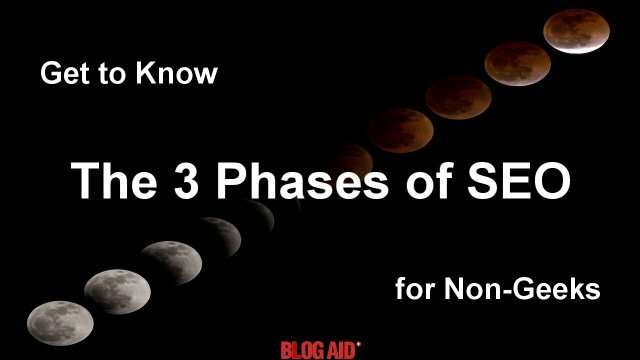 Every bit of Phase 1 is something you can easily do. This part of SEO is the one most site owners are familiar with. But there is hidden code on every post and page on your site that Google is indexing as well. This is also the type of SEO that Google has tweaked their algorithm on the most. That includes the introduction of AI (Artificial Intelligence) in making contextual sense of the content. If you’re still trying to get keyword approval from your SEO plugin, your tactics are seriously outdated. That kind of SEO went out in 2013. It may be time to update your methods, radically. Everything about Phase 2 is easy for you to do. This is the most coveted part of SEO. Its main focus is on inbound links, or backlinks. An inbound link is when another site links to yours. For instance, if you link to BlogAid from your site, I receive a backlink. It’s like a vote for BlogAid. The more inbound links your site has, the more important and authoritative Google and other search engines think it is. And, this is the only part of SEO that site owners might want to hire an agency to help them with. It’s very expensive and usually requires about six months of data mining with the agency’s expensive tools and expertise in reading the reports. But, you need to be super duper careful who you hire! More on that in a moment. It’s easy for non-geeks and DIY site owners to check their crawl errors and to set up their SEO plugin to accomplish all the Phase 1 SEO goals. In fact, you should know how to set up your SEO plugin because Google moves the cheese all the time and the Yoast SEO plugin keeps pace. Once you know the SEO plugin settings, making changes yourself takes all of 2 minutes. And then you’re right back in step with Google. No need to hire anybody. An SEO agency can’t really do much for you if the SEO foundation of your site is poor. And they really can’t help you if you are not creating authoritative content that is optimized for semantic search. Sure, they can research great keywords for your industry and place them strategically on your site in all the places Google indexes. But, if you don’t know how to do that for yourself, then you’ll need to constantly hire them to fix your content, or hire an SEO copywriter. In other words, you’re just wasting your money on an agency if you’re going to undermine their efforts with your SEO ignorance when you create content for your site. You’re not going to be happy with their results, and they are not going to be too happy working with you either! It’s easy to learn the basics of super SEO copy writing. In fact, Google has tweaked their algorithms to ensure that you write for both readers and search engines. Once you know what’s candy to Google now, you’ll automatically create content that way. Here’s where you can get into serious SEO trouble with your site if you don’t have the proper SEO education to vet hired help. If you hire an SEO agency, you expect to see results in the form of higher rankings. Period. If they can’t put you on the first page of Google in a hurry, then you’ll think they failed in their duty. It takes six months to a year for white hat SEO tactics to get your site ranked higher. It can take as little as two months for black hat SEO tactics to get you on the first page of Google. Black hat SEO agencies won’t ask you to shore up the SEO foundation on your site or write better copy either. Instead, they will overload it with hot keywords for your niche, and then swarm it with backlinks from other sites they own. Usually those are low-ranking sites. Those tactics will quickly trip wires at Google. The sheer volume of backlinks will cause your rank to rise, and quickly. Google is getting smarter every day. And it’s getting wise to the ways of black hat SEOers. Google is going to figure out that it’s been tricked. God help you when that happens. Google will slap so many warnings on your site that it will take you months, even up to a year, to recover. You’ll pay more for that recovery than you paid the agency to get you into that mess. And all the while your site ranking will drop lower than whale poop. The trick to SEO is there is no trick. There’s just consistently doing the right things. Google will reward you with more traffic. Getting all 11-14 levels of SEO on every page and post on your site will take you 1 minute more to tweak the elements you are already inputting on your site. In other words, you’re already doing the work. You just may not be getting all of the SEO benefits you could. My DIY SEO course and workshops take you step-by-step through Phases 1 and 2 of laying the proper SEO foundation on your site and making connections with Google Analytics and Google Search Console. You can go at your own pace and hone your SEO skills as you create new content. Plus, you’ll be able to shore up all the settings in your plugin and discover the hidden SEO settings all over your site. Those little things really add up! Plus, you get the full SEO benefit of your efforts and an edge over your competitors who haven’t taken these steps.